You can put this stuff on anything! There are a tonne of variations; for this one I just took one of the simplest recipes I could find and added roasted tomato and dried chilis. I made a big batch last week, and it was gone within a few days. I put it on chicken, grilled veggies, in a grilled cheese, mixed it into a vinaigrette, and then I ran out of sauce, so even I do not know the full extent of its capability! This sauce is even vegan, gluten free, and paleo. So it’s a great sauce to make if you have dietary restrictions. For a quicker version, use canned roasted red peppers and fresh garlic. Omit the tomatoes. 1. Preheat oven to 450 degrees f. Place red peppers in a deep sided baking dish and roast for 15 minutes, flipping after about 10 minutes. Add the tomatoes and garlic, then roast for another 10 minutes. You want a nice char on the peppers, so don’t worry about burning it since they will be peeled. 2. Place the roasted peppers in a plastic bag and seal, set aside the tomatoes and garlic. This will steam the peppers and make them easier to peel. After about 10 minutes they will be cool enough to peel. Discard the skins, stems, and peels. 3. While the peppers are cooling, lightly toast the almonds in a sauté pan. Don’t burn them. 4. Toss all the ingredients in a food processor and pulse to a consistent paste. Don’t over do it, you still want some texture in the sauce. 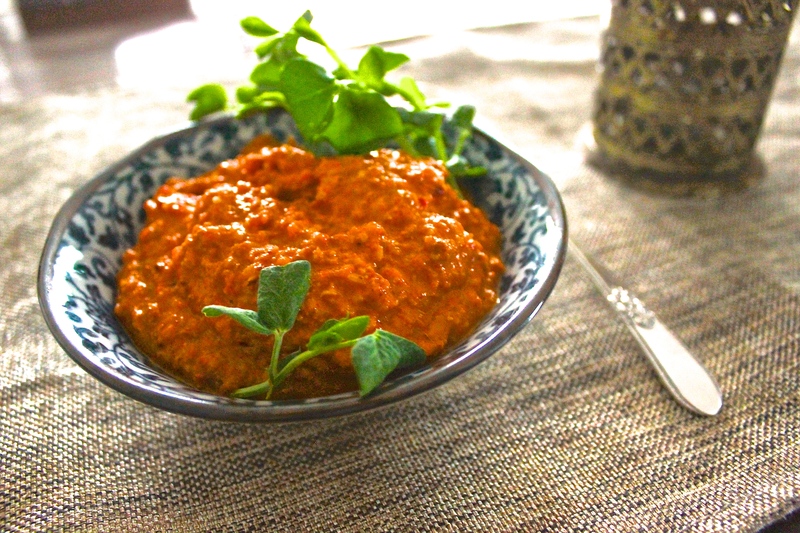 Romesco has been on my list of things to try for a while. Thanks for reminding me. This is a nice version — it makes a big difference to grill your own peppers. Thank you, Stefan! I find it hard to believe that you don’t already have a post about it :). Please let me know what you think after you make it. Completely agree regarding the peppers, so easy to do as well. I ended up buying a big 3 pound bag of fresh peppers at the local farmers market, which resulted in a lot of romesco! I will do a post when I make it.